Thank you all! I'll post more pictures when the progress has come along. Great turntable! Is that scratchbuilt by any chance? She's a beaut! It's a Diamond Scale Products I found on ebay. I was a bit intimidated to make my own from scratch so I was happy when I found it. It was a bit difficult to assemble especially to get it balanced in every direction. One strange thing is how the level of the bridge changes with the humidity in my basement train room. In summer it is level but now in winter when it is dryer inside it sits about 0.5-0.7mm higher. Must be the wood (plywood and MDF board)that contracts and expands so much with the humidity. 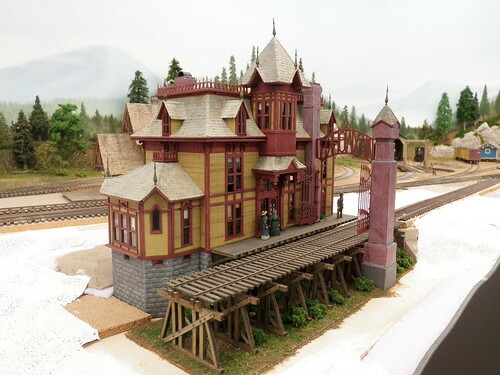 I have also a unbuilt Freshwater models Sellers turntable which will serve in Innsmouth. I have seen Daves excellent tutorial on how to assemble that one which I will closely follow. Thanks Hakan. You did a great job. Jack McKie sold the tooling for his Sellers Turndable to someone in Australia. I don't know if the kit has been reissued, I now wish I bought another one. It's a great kit! Keep those photos and updates coming! I�ve been away from the Forum for about 10 days I guess and this is the first I find. Great work! Thank you! Tack! I hope it gets better and better during the building. Right now I'm mounting my engine house to the layout. When the first engines roll in I'll post a photo of the ceremony . I also have some catching up to do on reading all interesting threads here on the forum. Great looking bench work. When I saw the first pictures I thought it was a small bench layout, then I saw the track plan. Wow, that�s going to be spectacular. Welcome Hakan. Thanks for sharing. You have really made a splash here with your input. Looking forward to more as you go along. Hi H�kan, this is one great looking layoutbuild. I can�t wait to see more progress pictures. Thanks Frank, Jerry and Magnus! I have made some progress so I post more photos shortly. One great looking layout Magnus and big! I liked you're stonework especially. Never thought to use "husfix". I'll try that. I have used sculptamold but I'm not entirely happy with it. Hello All! 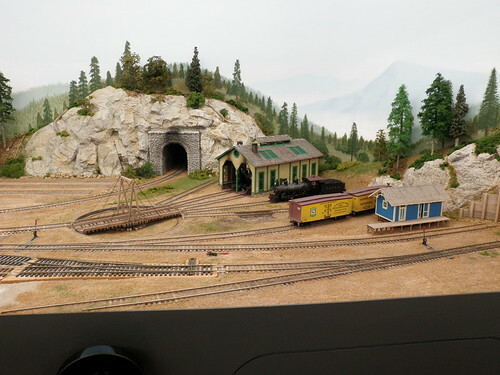 There has not been so much progress on the layout but I thought to post some pictures anyway. I have written some explanations beneath each picture. I also thought to share a little more of my layout background. My layout is freelance but tries to have a reasonable tie to reality. I try to do things on it that is plausible (in my opinion anyway ) and keeping the locomotives and rolling stock not newer then 1890-1895. I have soft spot for elaborate painted locomotives and rolling stock so some of my old equipment from the 1860-1870 is still very colorful and decorated. My brass hat Mr Smith-Kingsley keeps his stable of Iron horses spick and span. After all this is only a hobby. I have made up a little history for the Railroad to make it more plausible and� a well for it was great fun. This was the time of the opulent private car, nabobs and robber barons. General Palmer, Jim Hill and Henry Villard. Bonanza finds was yet to be discovered, inventions yet to be invented and rails yet to be lain. It was a time of optimism, it was the roaring 90s. A railroad which could connect with the Central Pacific who was building north at the times. But how would he finance it? The region was sparsely populated and the main resource was timber. By building little by little he could tap the rich timber and by that finance the building. Said and done he started out. The going was slow and the money was soon running out. He decided that he needed financial backing and went with his family to England where he met the up going industrial man Smith-Kingsley who became infatuated by Hogwallops daughter Edith and decided to join in on building the railroad. With his fresh money and new enthusiasm in the end of the 1880s the line was finished and had met up with the Central Pacific at Dunsmuir. The success was immediate and soon in Innsmouth ocean going vessels were unloading wares from the far orient for distribution east. Edith had married Smith-Kingsley and time went by and in the late 80s Hogwallop died. He left all the control to Smith-Kingsley who during this time had run the logging business. In the 90s the business was at its peak. The railroad had always had good revenue and all was kept in good working order, locomotives and rolling stock was kept clean and got new paint when needed. In that sense the railroad had a lot of common with the V&T apart from that it mostly transported tea not silver. 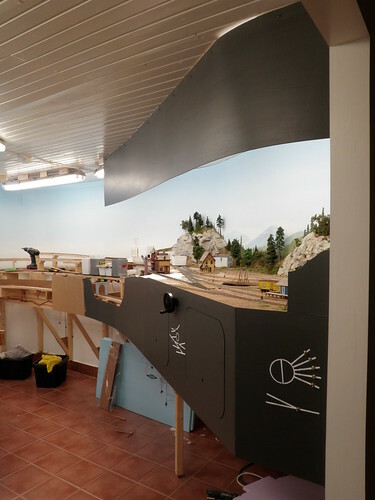 I have mounted a part of the valance above the scenery that is nearing completion. I thought to wait for this after all was completed but I was afraid to damage the scenery so I thought best to mount this when the scenery is nearly finished. It is difficult to work at the scenery nearest to the backdrop with the valance in place so I thought I finish that specific scenery before I mount it. The height was determined to a average height person standing upright viewing the layout and that he then should not see where the backdrop meets the ceiling. The valance is 3 mm masonite painted with dark grey Latex paint. I have started scenery below Dunsmuir and placed a industry above it. 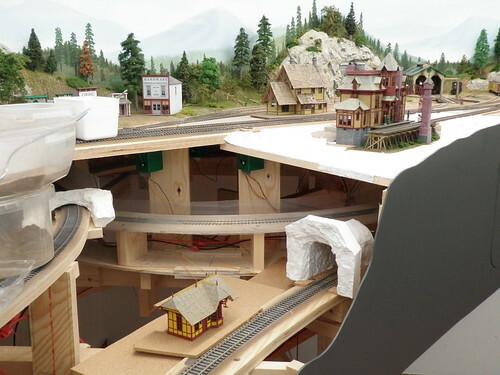 The industry was destined to be placed at another site on the layout but after some thought I realized that it could not be placed there. So I moved it here that was the only logical place left on the layout. The naked parts will loose its spagetti bowl look somewhat with mountain terrain. 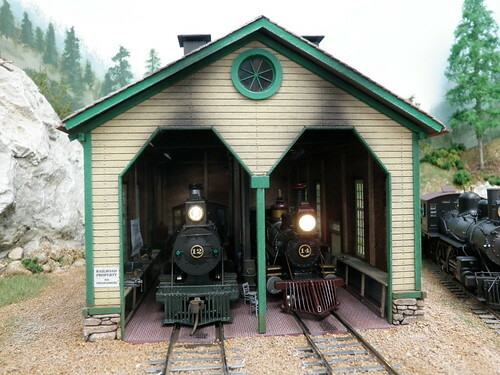 Below a small depot will be placed as seen on the photo. The industry. It is Master Creations "Watt Morelands Waxworks" with a somewhat ghoulish appearance. The Engine house has been mounted and is now ready to protect the Iron horses from the weather. There is a lot of detailing still to be done though. The area around the engine terminal. The freight station (Rusty Stumps) is newly built and will protect goods transfering through on the Southern Pacific(former CP). It is not yet mounted but will first get some slight weathering. The track nearest the viewer is SP trackage. The Hutchins reefers are from Art Griffins. The big pine trees are homemade with the "Jos" method. 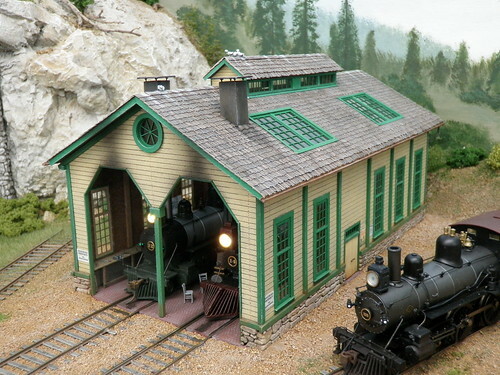 The smaller one is from Timberline scenery. As usual, Hakan..........Fantabulous! Very nice work. Things are shaping up verrrry nicely! I forgot one picture of the town. Lot of detailing still to do though. 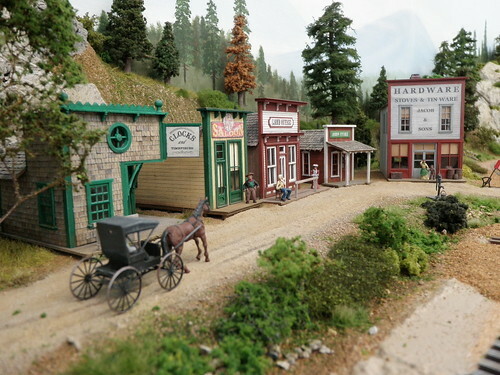 All are kits, Wild West Models, Campbell and BTS. I must try some scratchbuilding for a change . H�kan, you've done a beautiful job so far on your layout. The scenery is also outstanding. Layout looks outstanding - and great job on the locomotives - I've heard horror stories about Arbour Models steamers but yours look great.